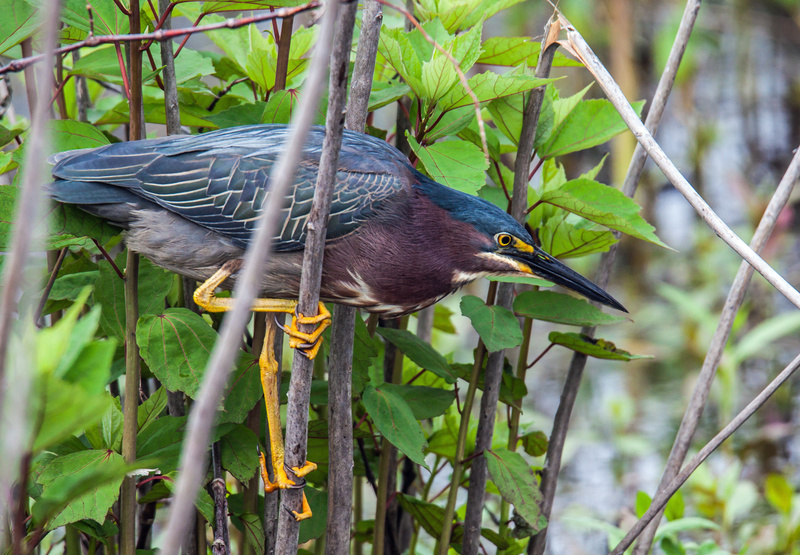 This Green Heron (Butorides virescens) picked a particularly precarious perch from which to focus on a potential prey this past Monday at Huntley Meadows Park in Alexandria, Virginia. The butterflies were really active today at Huntley Meadows Park and I nearly wore myself out chasing after them. 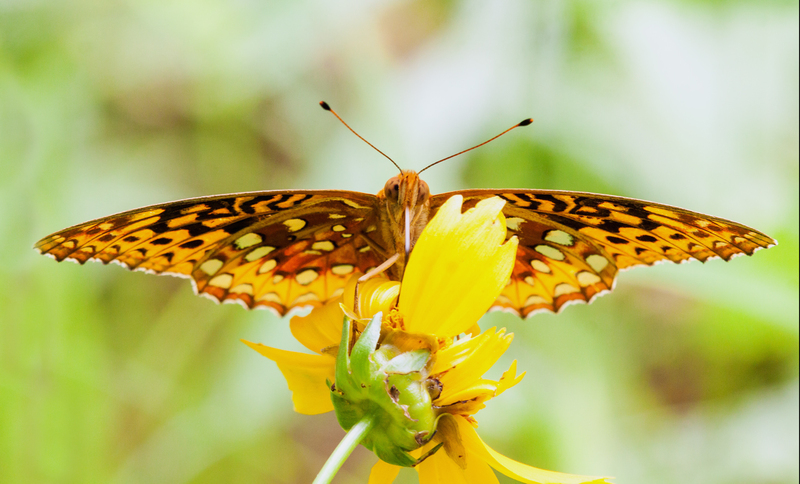 Fortunately one of them would occasionally perch, like this Great Spangled Fritillary (Speyeria cybele), whose image I was able to capture from an unusual perspective. Happy Memorial Day. Let us never forget the brave men and women who sacrificed so much for our freedom. Most of us know what it is like to change a lens on a DSLR, but what is it like when you change a lens in one of your eyes? About 48 hours ago, I had surgery to replace the lens in one of my eyes with a plastic intraocular lens (IOL). Cataracts in both of my eyes had advanced to a point where they were interfering with activities such as night driving and both my optometrist and my ophthalmologist recommended cataract surgery. I am in an interesting situation right now, because one of my eyes has been “fixed” and one of them has not. As a result I can’t help but do a series of before-and-after comparisons by looking at the world one eye at a time. 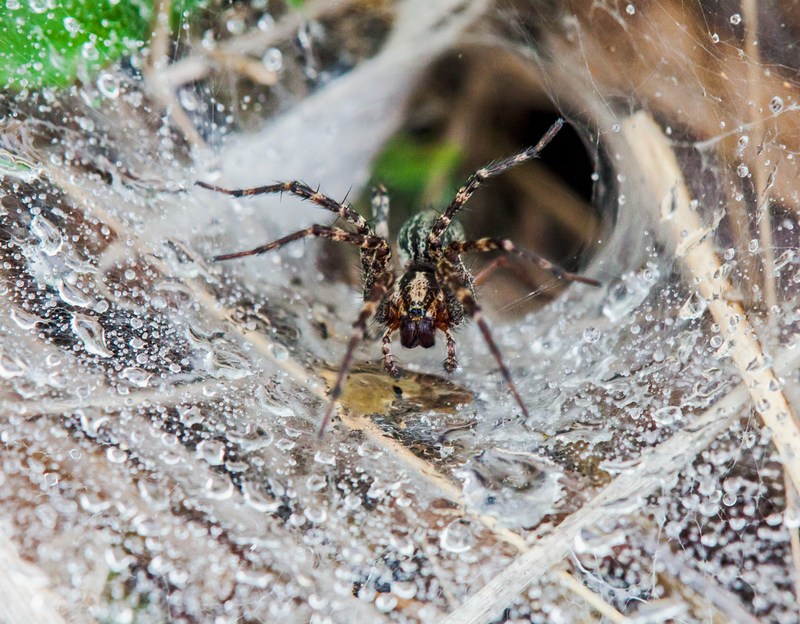 It’s hard to describe the changes, but it may be a little easier with photographers. Do you remember the first time that you looked at a RAW image? RAW images often look dull and flat. That’s kind of the way that things look in my right (uncorrected) eye. The view is darker, dingier, and has a slight yellow cast. The colors appear desaturated and there is not much contrast. When I look through my corrected eye, it feels like a RAW image that has been adjusted by a skilled photographer. The whites are pure white, the colors are vibrant, and sharpness and contrast have been tweaked. Interestingly, the colors are a little on the cool side, with a slight blue color cast. One thing I didn’t expect is that objects in my corrected eye are slightly bigger than in my uncorrected eye. I asked my ophthalmologist if the lens he implanted has a magnifying effect and he noted that it did not—the phenomenon I had described was caused by my myopia, which causes objects to look smaller. Previously I was significantly near-sighted and have needed glasses since I was in the fifth grade. The corrected eye is far-sighted now and my distance vision is amazing—for the first time in my life I was able to drive a car yesterday without glasses. My near vision now is essentially non-existent. I am hoping that it will improve a little bit as my eyes continue the adjustment process, but I fully expect that I will need the kind of reading glasses that I am using at this very moment. 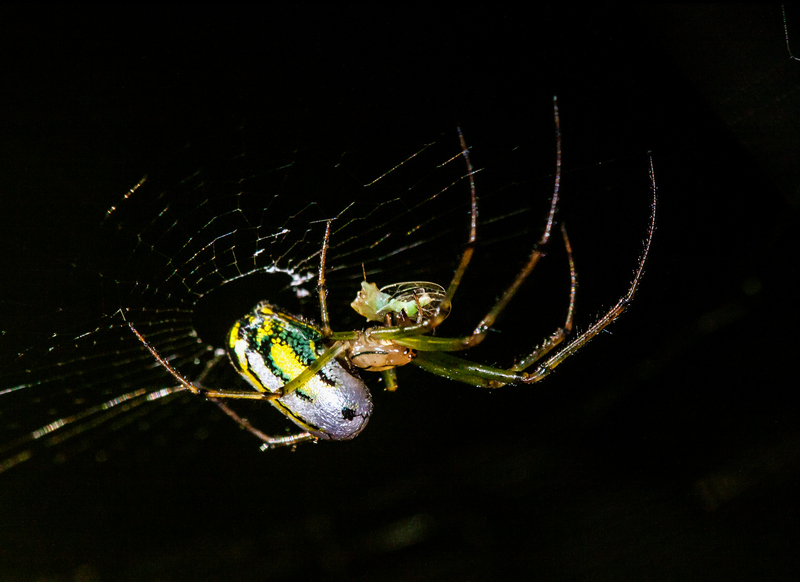 When I look at the spider with my uncorrected eye, the green and yellow on the spider’s body are pale and dull and the section of the body between the yellow areas appears to be gray. Looking though the corrected eye, however, I see a bright white area in between the bright yellow markings and even the green seems brighter and more intense. In another two weeks the lens in the right eye is scheduled to be replaced and I’ll probably start to take my newer, brighter world for granted. For now, though, all I have to do is close one eye at a time to see what a difference a change in lens can produce. Wildlife photography forces us to make a lot of choices in a short period of time, because we often encounter our subjects unexpectedly and don’t have the luxury of carefully planning all of our shots. 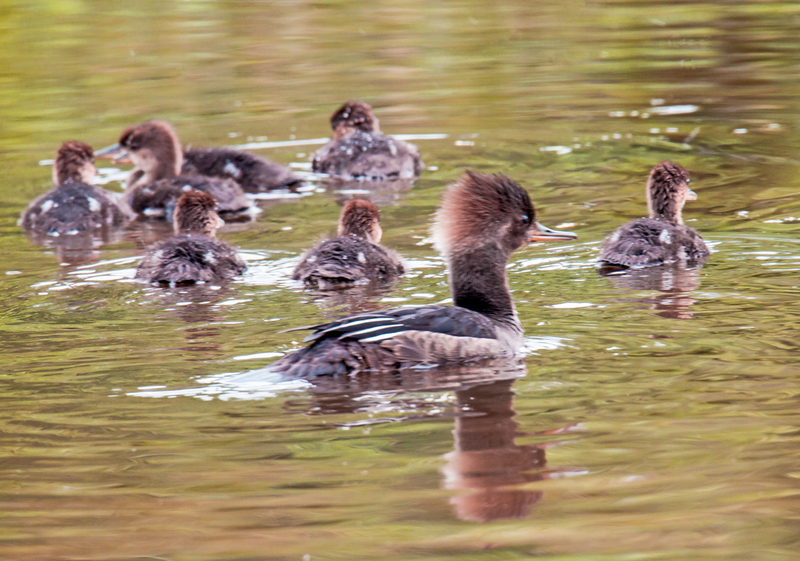 When I stumbled upon this Hooded Merganser family (Lophodytes cucullatus) on Monday at Huntley Meadows Park, for example, I had to make a quick choice. Should I focus on the hyper-vigilant Mom or on her ducklings? It’s hard to resist cuteness, so I initially focused on the babies. As you can see in the first shot below, the ducklings were relaxed and appeared to be preening and playing, while the Mom in the foreground kept watch. 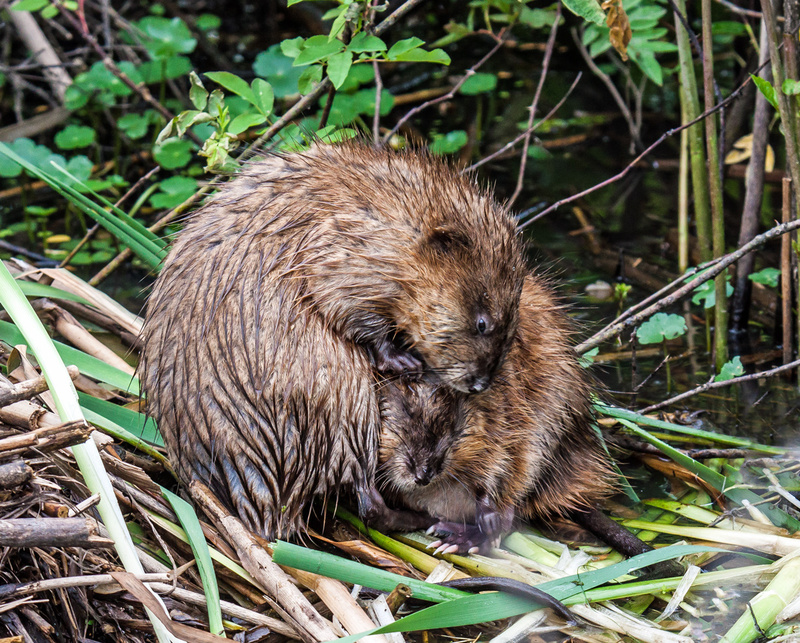 After I had taken a few shots, I switched my attention and my focus to the mother. 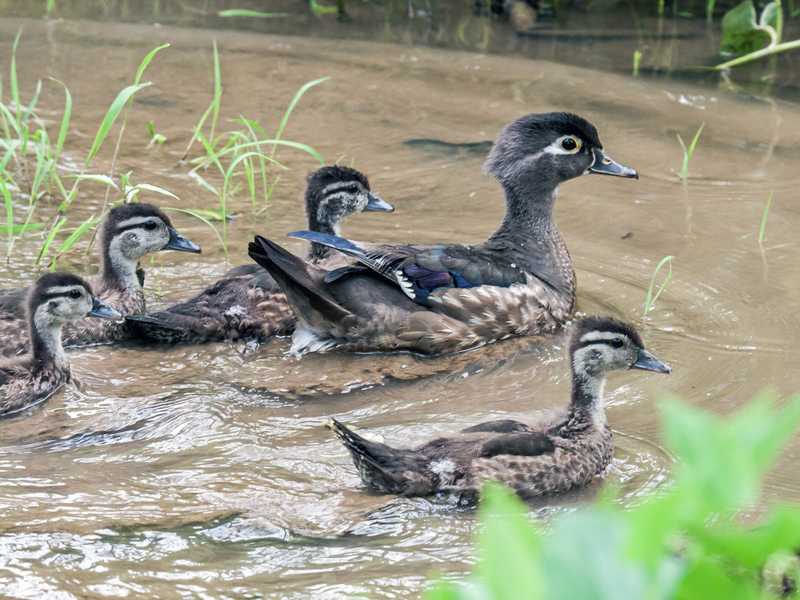 Her more rigid posture is in sharp contrast to that of her ducklings, who have faded a little into the background in the second shot. I think that my focusing choices cause each of the images to tell a slightly different story and causes a viewer to react differently. That’s one of the cool things I like about photography—our creative choices can help others to see the world in different ways as we gently guide their attention to what we think is important. 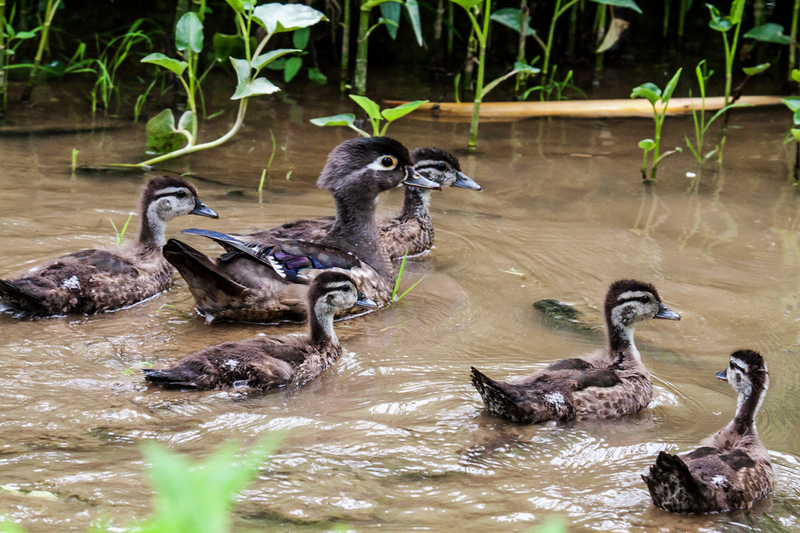 As I was getting ready to leave Huntley Meadows Park yesterday afternoon, a Wood Duck family (Aix sponsa) suddenly swam right in front of me from under the boardwalk. Even though I zoomed out, I was unable to capture the entire family with my long telephoto lens. 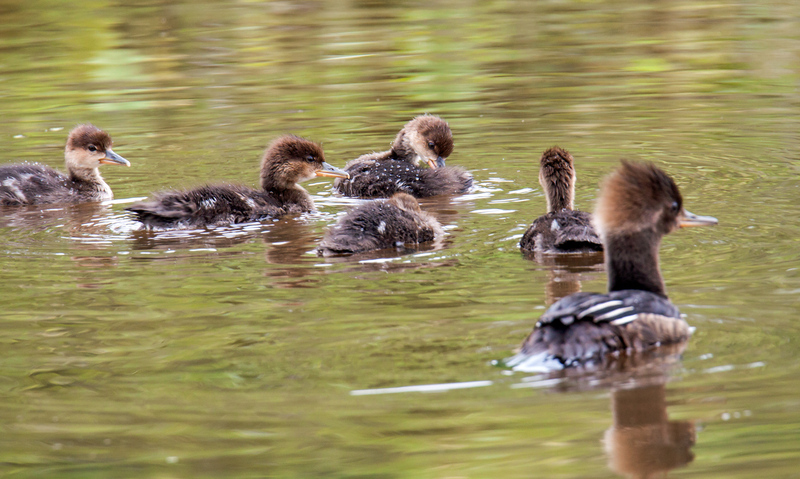 Here are a couple of shots of the mother and some of her ducklings. They were moving pretty quickly as a group and I didn’t have much time to get some shots before they disappeared into the vegetation.